Hello, all! It’s November now, but all I’ve been hearing for hours is rain. Still, there are Christmas cards to create. I have a couple of custom orders for them along with my own this year. This card, I’ll use for one of the orders. I feel like I made it out of practically nothing. Or, rather, it cost me practically nothing to do it, by the time I divide out all the pieces in the packs, etc. 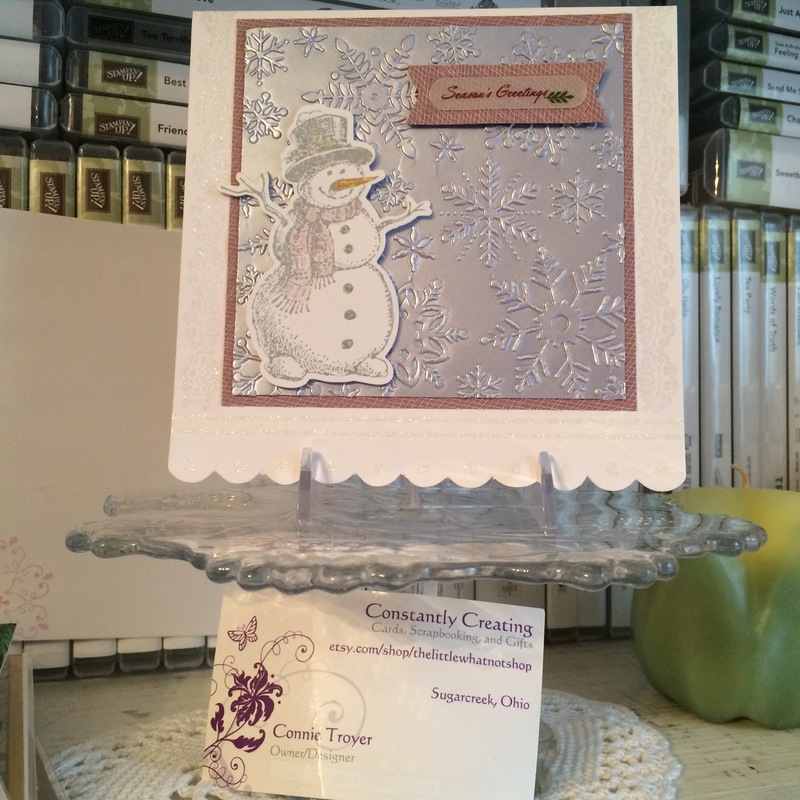 The card base from Die Cuts with a View was bought several years ago on clearance, and with this card I finally used up the pack (sad face here, as I loved them and have been hoarding them). 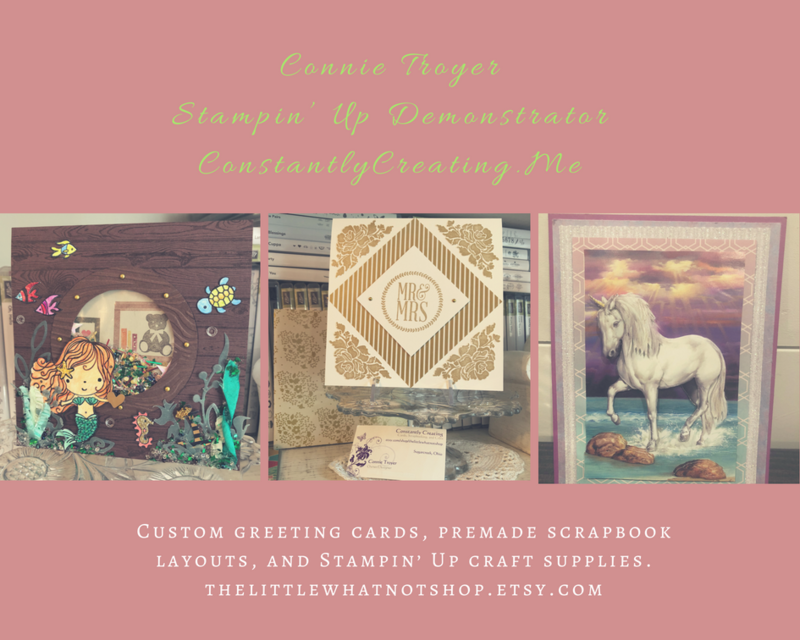 It has a scalloped edge on the front of the card with two lines of glitter above the scallops and dots of glitter inside each curve. I had a few sentiments that would fit the upper corner, but I had trouble deciding on one until my tiredness and the hour made the decision for me. (“Slap it down and move on,” my friend A likes to tell me. I actually listened this time.) I found this “Season’s Greetings” in a pack of rub-ons from American Crafts, so I put it on a scrap of vellum hanging out on my desk, punched it out with Stampin’ Up’s retired Word Window punch, ran it through my Xyron Sticker Maker, and then needed a way to make it show up, since vellum is see-through. 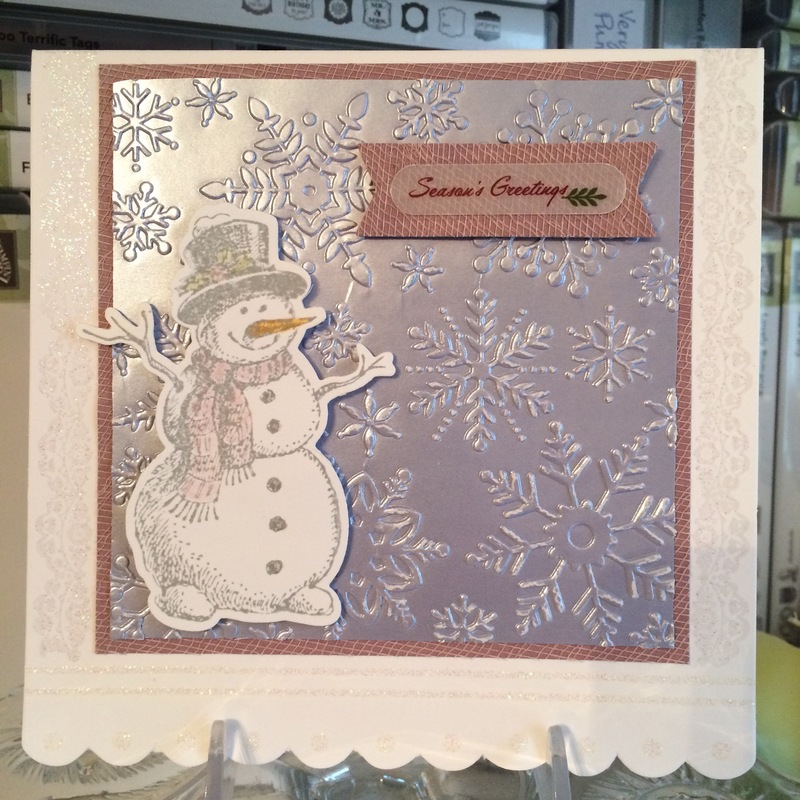 Enter a remnant of gauze paper, which I’d cut out of the center of the mat for the embossed snowflake background. (Why waste perfectly good material and hide it where no one will ever see? Craft supplies aren’t cheap!) I used a Spellbinders Die to cut the simple border, which fit the vellum rub-on sentiment perfectly. And this way we got to see a little more texture of that cool paper, since the mat behind the snowflakes is small by necessity. To echo the glitter that came on the card base, once I knew how much room I had to play with at the sides around the front piece, I stamped a border (bought from Oriental Trading) in VersaMark, poured on some retired Iridescent Ice glitter embossing powder from Stampin’ Up, and heat set it, one on each side. 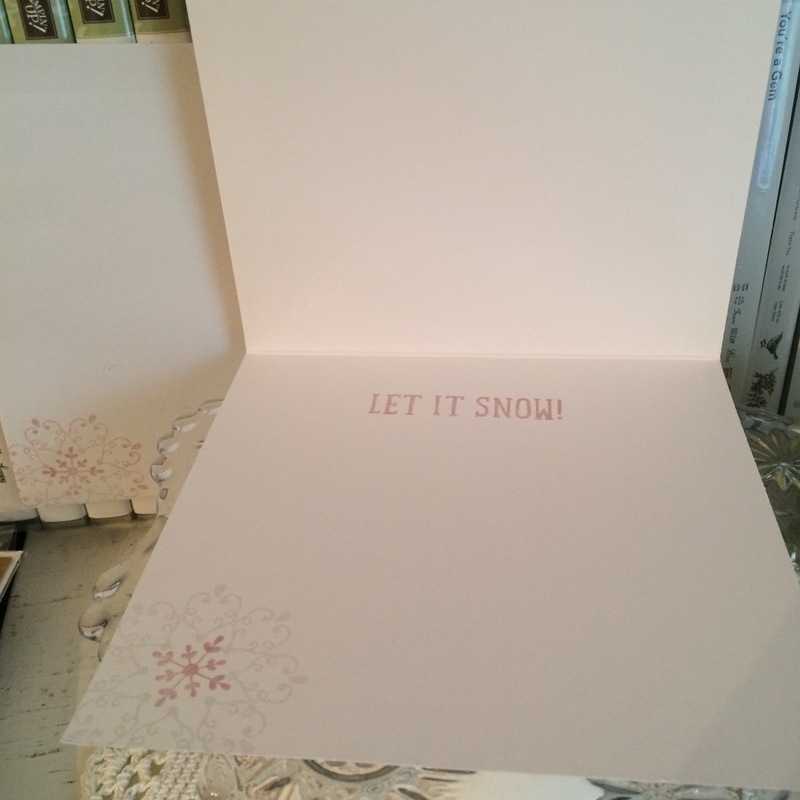 I kept the inside of the card simple with a “Let It Snow” stamp from SU’s “Snow Place” stamp set and a couple of snowflakes from SU’s retired “Letterpress Winter” set. I used Pale Plum ink (also SU, retired) and more of the retired Iridescent Ice glittered embossing powder. Fairly simple card overall, though some of the pieces took a bit of fiddling. I enjoyed this one and may try to make more of them with different snowmen and sentiments. Thanks for stopping by and reading!